The rivers of Central Montana are unlike those found elsewhere in the state. Flowing from the mighty Rocky Mountains and several island mountain ranges, the waterways then meander downhill, eventually meeting the Great Plains in their gradual journey eastward. This diversity of terrain lends itself to a variety of streams and rivers—from smaller rivers such as the Sun and Judith to the sweeping expanse of the trout-laden Missouri. Central Montana is tailor-made for adventurous anglers seeking a bit of solitude away from busier rivers. When most anglers think of fishing in Central Montana, the Missouri River comes to mind. This storied river first came to true popularity in the 1990s, when editorial coverage began to draw visitors from across the U.S. and abroad, seeking to experience "Trout Town U.S.A."
The most productive fishing section of the river flows from the small town of Craig to Cascade, just south of Great Falls. In this 35-mile section, the river sweeps through craggy cliffs and canyons before opening into the lower section where the river greets the Great Plains, both widening and slowing before reaching the community of Cascade. The Missouri is a prolific fishery, with as many as 2,000 rainbow trout per river mile in some sections. Despite the high numbers of fish, it can be a technical fishery with "educated" fish; visiting anglers are best served by connecting with a local guide and outfitter service to help find the best spots and techniques. Intent on heading out on your own? Stop at a local shop, chat with the staff, and buy a few recommended flies. In Cascade, check out the Trout Montana shop for gear and guides. You’ll also find lodging options in town along with groceries, restaurants, and bars. Great Falls, just 25 miles from Cascade, has a wide variety of lodging and dining options as well. North 40 Outfitters and Montana River Outfitters are based in Great Falls and can assist anglers seeking to set up trips and learn more about local waterways. Visit with the locals and they’ll point you to some lesser known streams like the Judith near Stanford or Big Spring Creek near Lewistown. The fishing community in Central Montana is tightly knit and eager to help. Looking for something other than trout? As the Missouri winds northward and then east past Great Falls, it acts as home to a variety of species, including sauger, pike, walleye, and catfish. Other rivers and lakes throughout Central Montana host everything from perch to whitefish and carp. Most anglers venture to Central Montana dreaming of trophy trout, be it a colored-up brown or a football-like rainbow. Those seeking classic dry-fly action will find the best times to visit are mid-spring (April/May), in July for terrestrial fishing, or in October. (Terrestrial lovers will find themselves happily occupied July through September; the river’s grassy banks are ideal for tossing big, foamy hoppers.) Nymph fishing, productive for those seeking high numbers of fish, is most productive in late spring (May/June) and then again in the early fall. Streamer anglers should visit in the early spring and late fall, though many seasoned Missouri River anglers are taking on the winter season with streamers to great success. If you’re planning to visit in the winter, reach out to Headhunters Fly Shop, which has established itself as the region’s leading Switch and Spey (two-handed fishing) resource and can offer both instruction and guided trips. Many of Central Montana’s smaller rivers and streams are best fished on foot, allowing anglers to take their time and really work sections of water. However, for larger rivers such as the Missouri, it’s easy and effective to cover large sections of water via boat. Most local guides prefer hard-sided "drift boats," specially designed to allow anglers comfort and range of motion, and low-sided to not be pushed about too much by the wind. 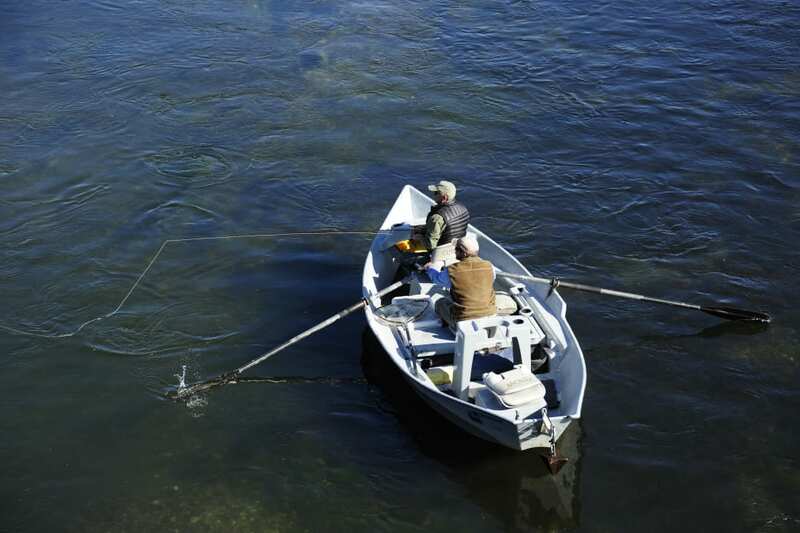 Rafts, pontoon boats, canoes and kayaks are also suitable for angling use—just make sure you have a savvy rower. 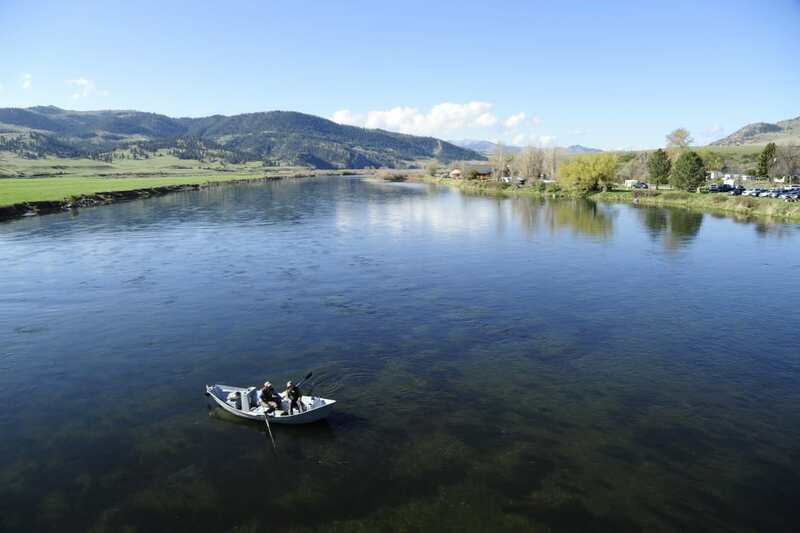 Whatever your angling style, Central Montana offers plenty of stunning waterways. Want to explore on foot and hike into small streams? Check. Keen to float down the famous Missouri River and chase fat rainbow trout? Check. Or maybe you want to get the kids out on Fresno Reservoir and simply let them experience their first fishing trip. That’s available, too. Central Montana is home to a high number of passionate anglers, eager to share their love for both sport and place. Written by Jess McGlothlin for RootsRated Media in partnership with Central Montana.